What do cars look like? A question a child (who doesn’t get out much) might ask, but not a childish question. Automotive styling, like fashion or diets named after cities, goes in trends. So what are the design trends we’re seeing now? To figure this out, I tried a little experiment. I actually tried this experiment first back in 2014: I had our photographer at the auto show (in this case, the Detroit Auto Show) take head-on pictures of as many cars as he could, and then I averaged them into one composite everycar. It’s not perfect, but it is interesting. This year, I was able to get 25 workable photos, from a number of car brands. 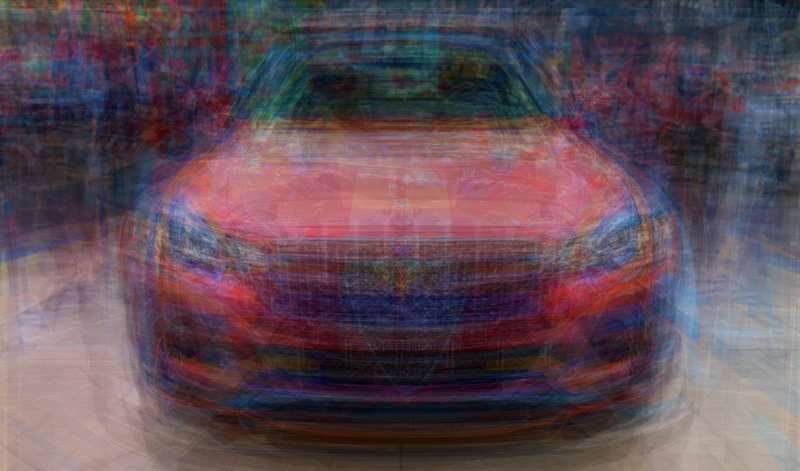 Here’s the brands in the batch of cars used to generate these images: Audi, Mercedes-Benz, Acura, Infiniti, Mazda, Jeep, Alfa Romeo, Volkswagen, Chevrolet, Toyota, Nissan, BMW, Volvo, Honda, Lexus, and Ford. That’s by no means comprehensive, but it’s a decent spectrum, though I think this image is a bit skewed to the upper end of the spectrum of cars. I used two methods to generate the image, both harnessing the raw computing power of the Jalopnik Mainframe, a massive array of 200 Commodore PETs with their 1MHz 6502 processors running in parallel, all housed in a kiddie pool in Barry White’s basement. I like how you can see the ghosts of the Alfa Grille, and the Jeep slats and round lights, if you look carefully. The result is a bit different, but we can still see some very clear trends about the car face of 2017. Width is the primary emphasis, with wide, mostly rectangular grilles, flanked by wide, narrow lights that angle up to the outside edges of the car. The look is determined and purposeful, aggressive, but not maniacal, exactly. The cars look wide and planted, with a lot of under-grille intakes and vents, usually divided between a wide, central under-bumper intake and a pair of flanking side vents. There was more visual height in 2014, and grilles now seem to be more likely to align their top edge with the headlights than before. I feel like things appear to have been distilled down and de-cluttered a bit, but that may just be because we didn’t include cars like the absurdly baroque vent-and-fold-and-flap-slathered new Prius. The mean one looks remarkably familiar, and could be any number of modern cars, I think; I’m seeing a lot of Infiniti in there. The median is a bit more peculiar, though that could just be the way I chose to find those outlines. Still, it wouldn’t look out of place in most modern parking lots. I have no idea why the colors always seem to average out to that pinkish-red, though. I always find this interesting. I’d like to try it again, with an even bigger sample, and do a truck and SUV version, as well. Maybe even divide it by price, so we average cars below, say $25,000, cars between $25,000 and $50,000, and $50,000 and up. There’s plenty more average car research to be done, but, until then, feel free to use these images for your theses and dissertations as needed. You know, I should try this by decade, too. I'm making a lot of work for myself.